Adult acne sneaks up on almost every woman, yet it’s rarely as simple as a single pimple that can be covered with a little makeup. As a woman’s body goes through pregnancy, begins to shift in their fertility and eventually hits menopause, hormones are flying, which can lead to some pretty strange side effects. 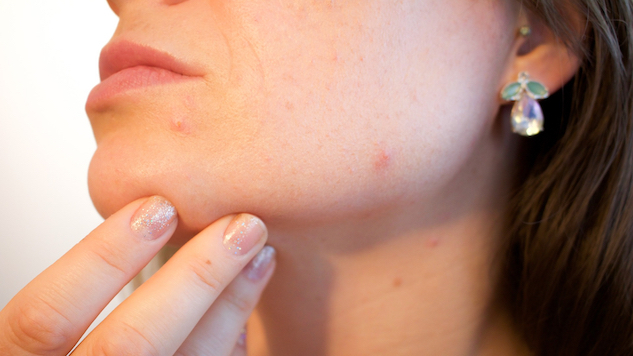 One of the most common is acne—especially on the chin. Most acne experts agree that chin acne is caused directly from changes in hormones, and can flare up the worst during PMS. I’ve personally noticed this effect when beginning new hormonal birth control pills. It may also indicate unexpected hormonal fluxes happening when everything seems normal, such as changes related to fertility or something going awry in pregnancy. After experiencing this unexpected flare up after a decade of perfect skin, I began to wonder what else my acne could indicate … aside from hormones that were a little off kilter. Here’s what I discovered. Chasen always recommends a minimum of eight hours of sleep a night. This kick-starts the healing process before changing your diet or skin care products can be effective. The chin is a known zone when it comes to reacting to food that may be an allergen or otherwise inflammatory. “Eating inflammatory foods like peanut butter, cow’s milk/yogurt and seaweed will all worsen existing acne,” says Chasen. Brian Zelickson M.D., founder of MD Complete Skincare, says that sugary foods cause a spike in your blood sugar, which can trigger breakouts. If you’re already prone to breakouts, or are fighting off hormonal changes, looking at your diet is the next step to figuring out why a family of pimples has moved in on your face. Smoking and drinking too much can cause acne to pop up or exacerbate what’s already there. Alcohol is known to dry out the skin and contribute to breakouts, and even being around secondhand smoke has been correlated to breakouts—and not just small ones. Cigarette smoke can lead to much worse cystic acne. If cancer, weight loss or hangovers haven’t convinced you to cut back on cigarettes and alcohol yet, maybe beauty will. So you’re acne might be telling you it’s time for a shower (no offense, says the pimple). Dirt and bacteria found around you can lead to acne, we all know that. But the culprit for said grime might be right under your nose … or fingernails, or bed, for that matter. Start cleaning up from the outside-in, starting with the face, hair and hands—where acne-causing grease loves to live. Chasen’s favorite “get clear fast” products are those with benzoyl peroxide, which she says “have a bad rap but do a great job of suffocating P.acnes bacteria and loosening plugs.” She suggests also adding an exfoliating serum. Your surroundings count, too. Wash your clothes and sheets regularly, and do those dishes! Oh, and no matter how many times you got through “Happy Birthday” while washing your hands, stop touching your face so much. Kelly Clay is a freelance writer from Seattle. When not working, she can be found hiking, at the lake or drinking too much coffee.